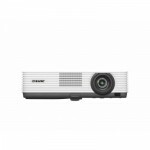 2,800 lumens colour light output with 3LCD BrightEraâ„¢ panel technology ensures crisply detailed XGA resolution images that are always seen clearly, even in daylit rooms. Weighing less than 3kg, the space-saving VPL-DX221 is easy to carry between meeting rooms or classrooms. The projectorâ€™s generous light output ensures that presentations are seen clearly in classrooms and meeting rooms.